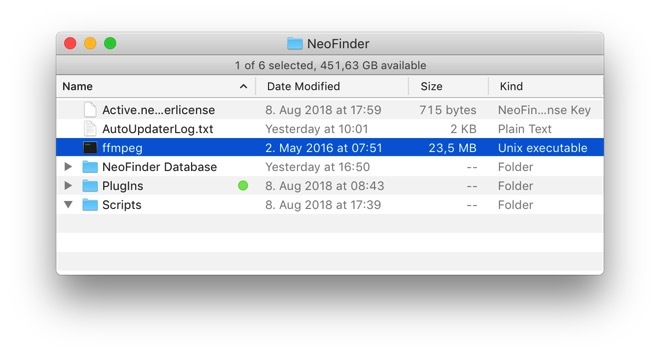 How NeoFinder catalogs your video files! NeoFinder supports a vast range of video files, and creates thumbnails of the movie files for you! It will also get the height and width of the video, as well as the duration and codec, if possible. 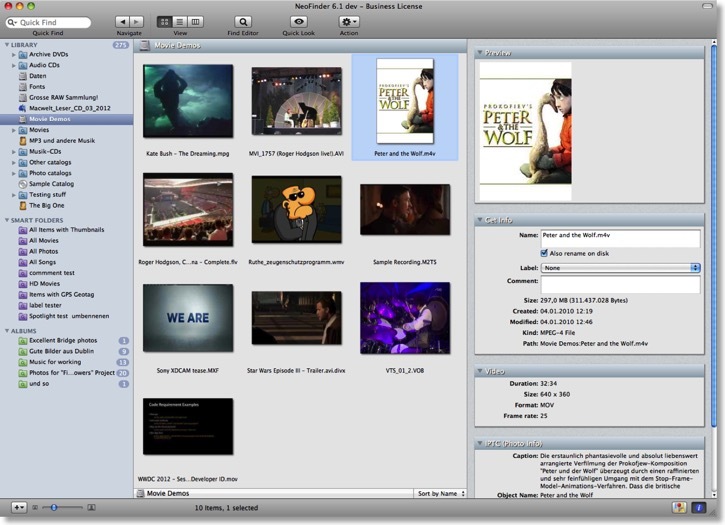 For many file formats (mostly .mov, .m4v, and .m4p), as well as the EyeTV format, NeoFinder will even grab textual annotations, if the file contains them! A large number of formats are supported, currently including the file suffixes: .mov, .mp4, .avi, .divx, .m4v, .qt, .flv, .mpg, .mkv, .dv, .wmv, .3gp, .webm, and .EyeTV (the popular EyeTV recordings). NeoFinder even supports the cool ffmpeg tool to create thumbnails of several MPG related file formats, including: MPG, MXF (used by Sony XDCAM), M2V, M2TS, MPV, MTS, TS, WEBM, FLV, and even VOB. Extract the downloaded archive. You should get a folder that contains a file named "ffmpeg". Place the ffmpeg file in there, so that NeoFinder can start using it. It would be nice if ffmpeg could simply come included with NeoFinder already, but their restrictive GPL licensing prevents this. Sorry. What frame does NeoFinder grab for you? NeoFinder doesn't simply grab the first frame of a movie, because that one is usually either black or otherwise boring, and NeoFinder doesn't do boring. Instead runs into about 20% of the complete duration of a movie, and grabs a frame from there. That gives you much better thumbnails! Of course, there is a hidden setting to control that value, if you need a different frame. Replace [val] with an integer value of 0 to 100, indicating the percentage into the duration of the movie. The default value is 20. The Digital Picture Exchange (DPX) video still files are supported by NeoFinder as well, starting with version 6.7. Please check the “Photos” section in the Preferences, as these are actually separate photo files for each frame. NeoFinder will generate a thumbnail for you, as well as reading the SMTPE timecode, if one is embedded in the DPX file. The Find Editor allows you to set up all kinds of queries, and you can use the Photo dimension parameters for videos as well. In fact, the “HD Movies” Smart Folder by default uses exactly that to find you all movies whose height is larger than 719 pixel, hence an HD movie. Of course, NeoFinder must have read the video metadata of your files during cataloging to be able to run such a Find. What about Apple Final Cut Pro FCPX projects? 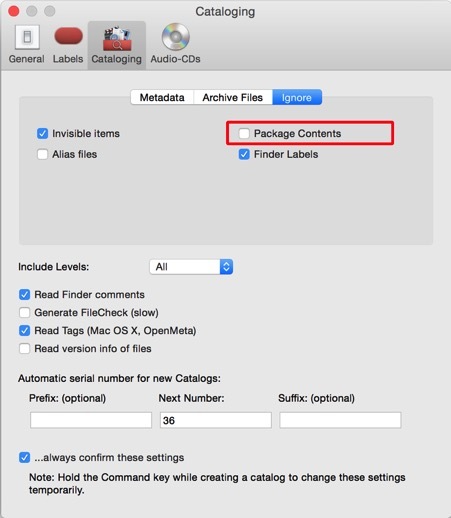 Apples video editing software stores its project data in “bundles” or “packages,” which look like real files, but are actually folders. NeoFinder also offers a unique Movie Contact Sheet!